'Future Active' is an exploration of the widening field of internet activism, of the key players and their ideas, and of the tactics and technologies that inspire them. The internet has enabled unprecedented global commerce and helped create new oligopolies - but it has also mobilised millions of people locally and globally with very different visions of connected world communities. 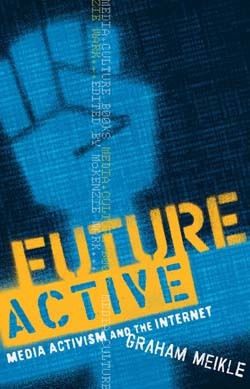 Future Active examines the use of the Internet as a tool to effect social, political and cultural change. The author provides case studies of milestone Net campaigns - key figures explain how Belgrade radio station B92 used the Net to thwart Milosevic's censorship, how the McSpotlight website contributed to the campaign of the defendants in the McLibel trial, and how the global Indymedia phenomenon was born. Graham Meikle is Associate Lecturer of Media and Communication at Macquarie University in Sydney. 16 February 1996: Shortly after 10 am a small crowd gathers outside a McDonald's outlet in London's Leicester Square to watch a part-time bar worker and an ex-postman switch on a computer. Using a borrowed laptop and mobile phone, Helen Steel and Dave Morris, the defendants in the McLibel trial, launch a new element of the anti-McDonald's campaign: the McSpotlight website, an enormous repository of information, criticism and debate about McDonald's. A subsequent press conference at London's first Internet café generates a lot of media attention. McSpotlight's server registers more than 35,000 visitors within the first 24 hours, with severe congestion keeping many others out by the first afternoon. The administrators are to claim more than 12 million hits for the first 15 months of operation, although a more realistic perspective on this comes from their calculation that this represents more than 300,000 actual visitors. 1700 visits in the first week alone originate from McDonald's own computer system. Dave Morris will later pronounce McSpotlight 'another nail in the coffin for McDonald's censorship strategy'. After defending themselves against the corporation's libel allegations in England's longest-ever trial, Steel and Morris are world authorities on most of McDonald's strategies, particularly their communications strategy. This encompasses not only an enormous annual advertising budget, and extensive community promotions, but also a lengthy trail of litigation. Those who have issued apologies on receipt of sharp letters from the chain include the BBC, who apologised in 1984 over a report linking beef production to deforestation, and The Guardian, who kowtowed three years later, after publishing an article about the corporation's employment practices. Besides these large, well-resourced organisations, other targets have included a Scottish youth theatre group which wrote a satirical play about the fast-food industry without mentioning McDonald's by name, and the owner of a small sandwich bar called McMunchies. Steel and Morris, along with three other members of a small autonomous group called London Greenpeace, were issued with libel writs in September 1990. The group had distributed a six-page leaflet titled 'What's Wrong With McDonald's? Everything They Don't Want You To Know'. It made claims about a range of corporate practices, from exploitative advertising through nutritional information to labour policies. The leaflet drew connections between multinational food chains and hunger in developing countries; it questioned the extent of McDonald's use of recycled packaging; and it argued that McDonald's ads 'deliberately exploit children'. It also attacked the corporation's treatment of animals and of its workers, and was decorated with doctored logos reading 'McCancer' and 'McMurder'. 'The leaflet brought all these arguments that different people were making against McDonald's and put [them] all in one place,' explains Jessy, one of the founders of McSpotlight, who prefers not to reveal her surname. 'The environmental movement, animal rights activists, trade unions, nutritionists, advertising standards campaigners: all these people were amassing evidence against McDonald's. All the leaflet did was tie them all together and ask: "do you still want to support this company?"' Faced with the Byzantine complexities of the UK's libel laws, and potentially ruinous costs, three of the group apologised and backed out; Steel and Morris, however, angered by what they saw as corporate censorship, chose to fight the suit. What followed was a surreal expedition through the legal system and corporate power, taking 314 days of court time, encompassing a counter-suit in which the defendants turned the tables on McDonald's for distributing 300,000 leaflets of their own (which labelled Steel and Morris liars), and spawning a film and a book, as well as the McSpotlight site. The site itself exists as an unlikely consequence of the UK libel laws. The McLibel defendants were required not only to prove that every word of the offending leaflet was true, but to do so using primary research sources - previously published materials were inadmissible, so Steel and Morris had to conduct interviews and depose witnesses. This meant that as the case went on, their research developed into a formidable archive of information. The initial idea for the McSpotlight site was to create a kind of library. With more than 21,000 files taking up over 120 Mb of space, McSpotlight is potentially daunting to new visitors. But its creative design and skilful organisation demonstrate that a successful activist site must cater for participants with wildly divergent levels of interest and expertise, both in the technology and in the issues. A guided tour of the site's key features with audio commentary by Steel and Morris is available, for example. The material ranges from a complete archive of transcripts of the trial through to satirical animations; from a history of McDonald's through to more than 600 links to other anti-corporate campaigns. The McSpotlight organisers are proud of this mix of range and depth. This organisation of content into different levels is one of the strengths of McSpotlight. Information is obviously a key to successful campaigning, so one of the core functions of any activist website has to be not only making hard-to-find information available, but also presenting it in as accessible a fashion as possible. The very success of McSpotlight shows, paradoxically, that the Net is not a soft option for activists. Making the most of its potential demands serious skills - not in state-of-the-art design or animation, but in information management and provision. If, for example, web designers don't try to anticipate the needs and abilities of those most likely to use their site, information overload is a real risk. As the Net continues to expand, filtering out signal from noise becomes, if not harder, then certainly more and more time-consuming. Anyone who has tried to do research online will be familiar with the hyperlink spiral, where each site opens up possibilities which hadn't been evident before: the right piece of information is always one more click away. This can be exhilarating and productive, of course, but it can also be paralysing, producing nothing more than the feeling of being in a dense swamp of bookmarks and printouts. Jordan describes how cyberspace not only offers more information, but also encourages people to produce more of it: email, newsgroup posts, simple web pages. He argues that the catch-22 of this is that attempts to manage information overload invariably involve technological fixes which themselves create more information: the point-and-click graphical user interface of the web browser, for example, makes online information more accessible, but also makes it easier for still more people to generate yet more content. Jordan notes that using a software program or intelligent agent to manage or filter your email, calls or news means having to master the additional information you need to use that program effectively. And he argues that applications which offer synopses of information (stock tickers, daily news digests) contribute to information overload rather than managing it, because each synopsis interposes one more piece of potentially unmissable data. McSpotlight certainly contains more info than most of us could absorb, with everything from the full text of Justice Bell's 800-page McLibel judgement to an account of a campaign of hoax bomb threats by anti-McDonald's activists in Poland. But Jordan's second point, that information can be so badly organised as to be impossible to find, is one the McSpotlight team is well aware of. One example of a group McSpotlight helped is Mountains Against McDonald's (MAM), in the Blue Mountains near Sydney. While MAM may not have seen themselves as working towards an anarchist society, as Morris puts it, they did offer an example of a local community networking internationally, and using the Internet to help this process. September 1996: McDonald's applies for permission to open an outlet near Katoomba in the Blue Mountains, emphasising job creation and a projected $900,000 annual payroll. The local community mobilises to influence the local council. Their campaign centres around traditional strategies, including leafleting, letter-writing, and a rally on 8 December that draws 700 people to hear messages of support from prominent figures, including David Suzuki. Early in the campaign, MAM media spokesperson Gillian Appleton finds the McSpotlight site, and draws upon its case studies of residents' actions around the world for the two issues of a broadsheet newspaper that the group is to produce. On 7 February 1997, McDonald's notified MAM that it would not be proceeding with its application. In any event, the local council were to reject their application two weeks later, having accepted the campaigners' arguments about the need to preserve the distinctive identity of the Blue Mountains area. In the same month, on its first anniversary, McSpotlight doubled in size, as all the official court transcripts of the trial were added to its resources. The Blue Mountains campaign is an example of activists using a medium routinely conceptualised in terms of its global nature, to facilitate action at a local level. Recognising the importance of this, other groups are turning to Geographic Information Systems (GIS) to organise data into forms which are not only accessible but can also be acted on in specific locations. These databases offer a map interface which users can manipulate to zoom in on a particular region, town or suburb to filter the relevant information. GIS is already becoming familiar in commercial applications, such as street directories for large cities. If you're having a party, for instance, you can use a mapping database of your city to highlight your street and its surrounding area on a grid map, mark your address, along with the locations of the nearest train station and bottle shop, and either print out or email the whole thing along with the invitation. This kind of combination of enormous databases and simple maps offers powerful possibilities to activists. One interesting example is the Hybrid Media Lounge, a project co-ordinated by the Society for Old and New Media in Amsterdam. This site maps individuals and groups across Europe who are active over a broad spectrum of cultural politics and digital media. By using the mapping database, we can compare groups from country to country, trace their networks of collaboration and dialogue, and cross-match demographic data on funding, infrastructure and resources. The database also shows how the participants rate themselves on a range of qualities and areas of specialisation: groups from most countries, for instance, rate themselves as stronger in 'practice' than in 'theory'. Those from the former Yugoslavia score themselves highest in 'political correctness'. And almost everyone gives themselves top marks for 'intellectualism'. In the UK, Friends of the Earth launched its Factory Watch GIS in February 1999. By clicking on their own region or town, or by entering their postcode, anyone can access data on toxic emissions from factories in their area, sourced from the government's Environment Agency. The data can be viewed in a range of different forms, allowing people to quickly build their own dossiers on particular suburbs, factories, corporations, chemicals or health risks. In terms of grassroots campaigners actually making use of this Factory Watch data, Mike Childs, a senior pollution campaigner with FOE, acknowledges that there are some problems with the database as yet, noting that the worst-offending factories tend to be located in low-income areas, where Internet access can be assumed to be low. But he points to the project's potential, and argues that the availability of the information in this form is already having some impact. Environmental campaigners have been building databases on toxic emissions for years: in the 1980s the US Public Data Access project collated a database, searchable by zip code, which could be used, for example, to calculate potential statistical correlations between cancer incidences and the locations of nuclear facilities. But combining these kinds of huge databases with a simple map interface offers powerful new possibilities for structuring the data into an accessible form. A clickable map was used, for instance, in the NetDay 96 project, the aim of which was to use volunteers to wire every school in California to the Internet. By zooming in and out on particular districts or schools, potential volunteers could gauge the extent of existing participation, and decide whether or not their own contribution might help. 19 June 1997: The McLibel verdict is in. Chief Justice Bell rules that McDonald's exploit children through their advertising; are cruel to the animals used in their products; and pay low wages, 'thereby helping to depress wages for workers in the catering trade in Britain'. He also points to discrepancies between the nutritional claims made in McDonald's promotions and the actual content of their food. Steel and Morris are, however, found to have libelled McDonald's on a number of other counts, and are ordered to pay £60,000 in damages. But, perhaps sated on bad publicity, McDonald's announce that they will not be pursuing this. A McSpotlight volunteer is in court and phones the details through - they appear on the site before the mainstream media have been able to turn the story around. Many reporters in fact contact McSpotlight to find out the verdict. Interest in the case is at its peak, and following the verdict the site is accessed more than 2.2 million times; by 1999, McSpotlight will claim to have been accessed more than 65 million times. More than 3 million of the original leaflets, available as ready-to-print downloads at the site, in languages from Japanese to Swedish, have been distributed in the UK alone since the beginning of the legal proceedings in 1990, including 400,000 in the days immediately following the June 1997 verdict. The corporation's attempts to halt the leafleting, including their application for an injunction against the defendants, are abandoned. Remarkably, given the corporation's track record of legal action and the site's inclusion of material which had previously been suppressed, McSpotlight has attracted no official attention from McDonald's: no cease-and-desist letters, no writs. This may suggest that the corporation has learned the hard way - the case, on which they spent a reputed £10 million, and which attracted some of the worst coverage imaginable, was a PR debacle. But it could also be tacit recognition of the unfeasibility of shutting the site down. McSpotlight is solid evidence for many of the claims that have been made for the resilience of Internet materials in the face of censorship attempts. Leaving aside the fact that a huge number of people have already visited the site and read the material, including the leaflet at the centre of the libel trial, McSpotlight is hosted on several different servers around the world. Any legal action would need to be co-ordinated across a number of different legal systems and jurisdictions - the libel provisions of at least some of these may be less weighted in favour of the litigant than are those of the UK. The entire site contents are also available on CD-ROM, and a complete earlier version of the site was for a time available as a compressed download, enabling anyone to retrieve and host a copy on their own website. Any attempts to censor the site would almost certainly result in a PR disaster to rival the court case itself, as supporters would set up additional mirrors and publicise both their locations and the legal action. While the famous claim that 'the Net treats censorship as damage and routes around it' may be frustrating in its technological determinism, in its emphasis on the properties of the technology, the geographical dispersion of McSpotlight is evidence that many people are both able and prepared to 'route around' censorship attempts. It's significant that McSpotlight continues to draw visitors, even with the trial long over. One reason for this may be 'Beyond McDonald's', its expanding section about campaigns against other transnational corporations. But its debating room, a cluster of ongoing discussion forums, also continues to generate substantial traffic on the trial and the issues raised, more than four years after the verdict. The importance of this opportunity to discuss the issues raised by the site can't be overstated. While the McLibel defendants benefited greatly from the Net, using it, for instance, to collect witness statements by email (a significant advantage over overseas phone calls, given their lack of resources), they both remain committed to the power of leafleting. Dave Morris emphasised to the McLibel documentary makers that 'it's a very immediate form of dealing with basic ideas - people can stop and have a chat, they can see that you're a human being. Whereas, for example, people getting things from television or from books, there's no real communication.' Taking this comment on board, McSpotlight claim to have been among the first to exploit the potential of the conversational dimension on the web, to adapt the two-way potential of early, computer-mediated communication applications to a web-based campaign. But corporations live or die by their communication strategies as much as do social change campaigners. Any innovative use of a new medium, such as McSpotlight's early adoption of discussion forum software, can easily be co-opted for corporate promotions. While McDonald's have yet to try this particular approach, Shell Oil promotes discussion forums at its website, on topics including 'Human Rights: None of Our Business or the Heart of Our Business?' and 'Islands of Wealth - Wages and Local Investment'. Unsurprisingly, a large number of posts displayed in the Shell forums are extremely positive about the corporation, and while it may well be true that there are large numbers of people out there who are keen to express their pleasure in Shell products and practices, others have shown that this is exactly the kind of support which money can buy. For example, unable to count on spontaneous groundswells of public enthusiasm, many corporations have turned to the practice of 'astroturfing' - contrived 'grassroots' support campaigns which combine corporate funding with state-of-the-art PR. The Center for Media and Democracy works to expose such astroturf campaigns, issuing a range of publications analysing groups such as the now-defunct National Smokers Alliance. This pro-tobacco lobby group, with its slick website, claimed to have more than three million members supporting its struggle against 'anti-smoking zealots [who] have shown that they will stop at nothing in their goal to create a smoke-free society'. The catch with this campaign was that it openly stated that it was founded with cash from the Philip Morris corporation, makers of Marlboro and Benson & Hedges, adding - with no obvious irony - that its policy of 'no-strings-attached independence has allowed the NSA to earn contributions from two other cigarette manufacturers'. Faced with the realities of this kind of corporate counter-activism, the challenge for campaigners is to keep ahead of corporate responses, to continually experiment with new approaches. This doesn't mean entering a software arms race or relying on state-of-the-art equipment as much as it means finding new ways of exploiting the basics - such as email - to enable genuine communication, the exchange of relevant information, and making this information as easy to act on as possible.